Cleaning Marble Window Sills to Keep Them Looking Like New! Many homeowners are under the misconception that when they invest in a home or commercial building that includes higher than standard material, they don’t need to worry about maintaining it much. The truth is, everything needs some type of maintenance—even if it’s built to last! You can build your house with stone, but after awhile, the weather will get to it causing it to discolor and possibly even chip or crack under extreme circumstances. Nonetheless, building with natural stone is going to be the better choice compared to wood. When it comes to installing window sills, choosing the right kind of building material isn’t any different. Window sills are the type of finishing that can bring a whole new level of elegance and sophistication to your build. The fact of the matter is, not every builder is investing into his or her projects to this level of detail. That’s because many may think that in order to install marble window sills, you also need to incorporate marble floors as well. Buying marble floors and having them installed in your project can add a hefty expense. If you’re not catering to that kind of buyer, but desire to bring about a different quality in your build that will rival your clients, incorporating marble window sills is the way to go. You don’t necessarily have to have marble floors for this either. Marble is such a diverse type of natural stone, that it will complement any kind of floor giving the space yet another level of decorative depth and regal posh. Even if posh is not exactly what you’re going for, marble window sills is versatile enough to go with any kind of décor. From steam punk, modern mid-century designs, Art Deco, or a traditional southern feel, selecting the right kind of window sill will give your windows, whether it’s interior or exterior, a solid look that will give any buyer confidence that they are investing in a quality build. Now, once the purchase has been made, it’s highly recommended that you educate your buyers on what they’ve purchased and what it means to keep it looking as good as it did the day they bought it. Marble is a durable natural stone that is built to last. So any contracting company who invests this type of material into their build can be said to have a fairly decent dwelling. Of course, it’s always recommended to do a full home inspection to determine whether or not this is the case. At any rate, even good quality material needs to be cared for. Many homeowners make the mistake of thinking that just because they’re paying for a quality material like marble, which has indeed stood the test of time in regards to durability, doesn’t need any maintenance. The fact of the matter is yes, marble stone—window sills, to be exact is indeed a strong building material. It’s going to be stronger than the standard alternatives like vinyl or wood, and unlike inferior materials, you won’t need to give these types of window sills much attention because you won’t have to worry about it getting dented, or nicked because marble’s surface is so hard. But like any kind of surface, it will collect dust and it will be exposed to the elements, and after awhile, it’s surface will be affected by it—if it is not properly maintained. When it comes to cleaning surfaces, many people will grab some all-purpose cleaning spray to wipe away dust and other kinds of filth. If you want your marble window sills to keep its lustrous shine, you will not be able to use these kinds of products on your window sills. In fact, you’ll need to steer clear of any acidic substances. So that means even the organic, chemical-free solvents that have natural lemon juice and/or vinegar in it cannot be used on marble surfaces. Marble is tough. It won’t bend, and it won’t catch on fire. While the slab is waterproof, it is porous. The porosity in marble slabs are microscopic, but if something colorful like wine or any kind of condiment were to spill on to the surface, if the marble slab isn’t properly sealed, those colors will slowly seep into the surface discoloring it and giving it an entirely different kind of look. You can go to your local home improvement store and purchase a marble sealer that you can apply to your marble window sills every 12-16 months. If you have exterior marble window sills, then it’s recommended to apply a sealant every 12 months. 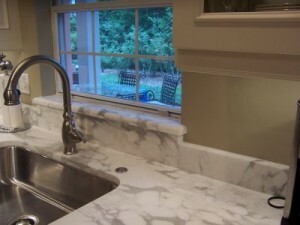 Interior marble window sills can be treated every 16 months. The application process is quite simple. First, make sure that the surface is clean. You do this by using a soft cotton cloth and dipping it in warm, soapy water. Then once the marble surface is clean and dry, then you take another cloth, dip it in solvent-based water and generously apply it. To test that you have applied enough, pour a little bit of water on the surface and see if it beads up. If it does, then it’s properly sealed. When you’re selling your builds, whether it’s a residential or commercial dwelling, it is important to educate your buyers about what type of dwelling their purchasing. Buyers should be informed about everything from the plumbing, electrical wiring to caring for your marble windows sills—all of it is important! To learn more about caring for your marble window sills and purchasing a bulk amount for your future builds, contact Stonexchange at 305-731-2400 or contact us online.